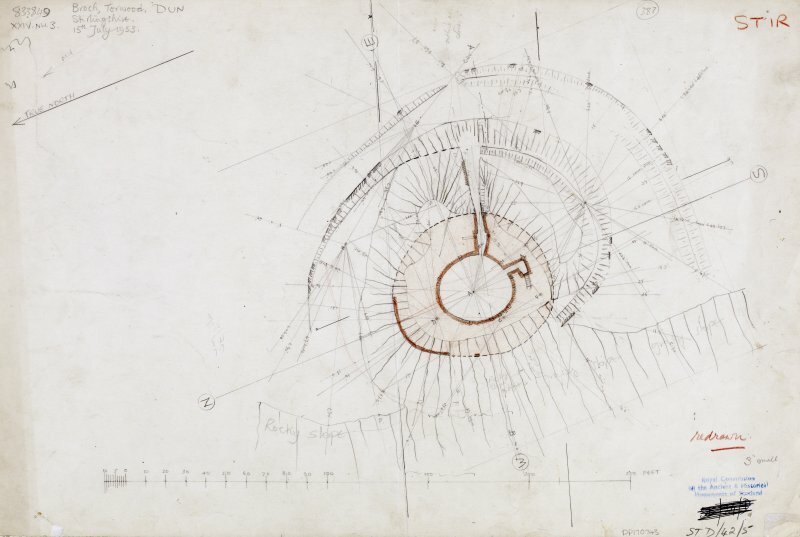 Plan and details of Tappoch broch. 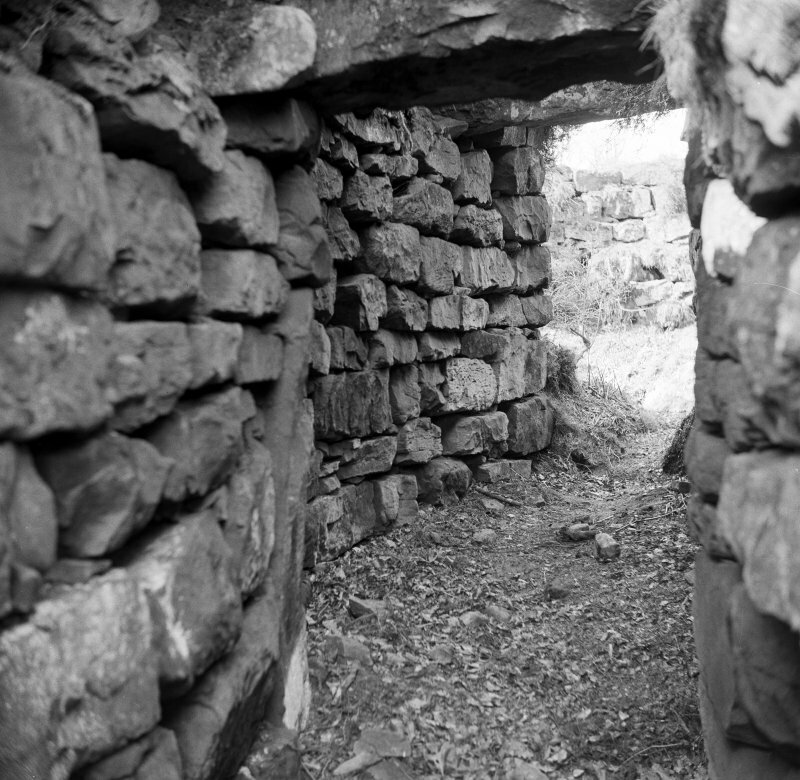 Interior of the Tappoch broch. Broch, The Tappoch, Tor Wood: This feature which occupies a typical position for a Lowland broch, was excavated in 1864 (J Dundas 1868). Prior to the excavation it appeared simply as a mound. The excavators, who considered it was simply a chamber sunk in a natural knoll, removed a mass of boulders and debris, estimated to weigh over 200 tons, exposing the inner wall-faces, and an inclined floor formed by the natural rock, and opened the entrance passage, stair-lobby and stair. On the floor they found a central hearth and a number of relics described below. No attempt was made to find the outer wall-face, which is now almost totally hidden by earth and debris. Portions which appear on W, NW, and N give wall thicknesses of from 17' - 24'. These are not at ground level, but slightly above the scarcement; the ground level thickness, as measured along the entrance passage, is 20'6". The entrance is in the SE and is 2'7" wide. It is today approached by a sunken pathway through the debris surrounding the outside of the broch, and the stonework and kerbing along the sides of this path probably represent revetments inserted in 1864 to retain the debris. The entrance has door-checks and a bar-hole. The interior is irregularly circular. The rock floor found by the excavators is covered with debris, earth, and vegetation. The wall-face contains numerous small recesses about 1' or less in height and breadth, and from 1' - 3' in depth. Their purpose is obscure, and the excavators reported that nothing was found in them "except some white clay peculiar to Torwood". Their number is difficult to calculate, as in some places rather similar cavities have resulted from dislodgement of facing stones, but at least 13 may be regarded as constructional features. A stair-lobby and stair occur in the thickness of the wall. Eight steps now remain. 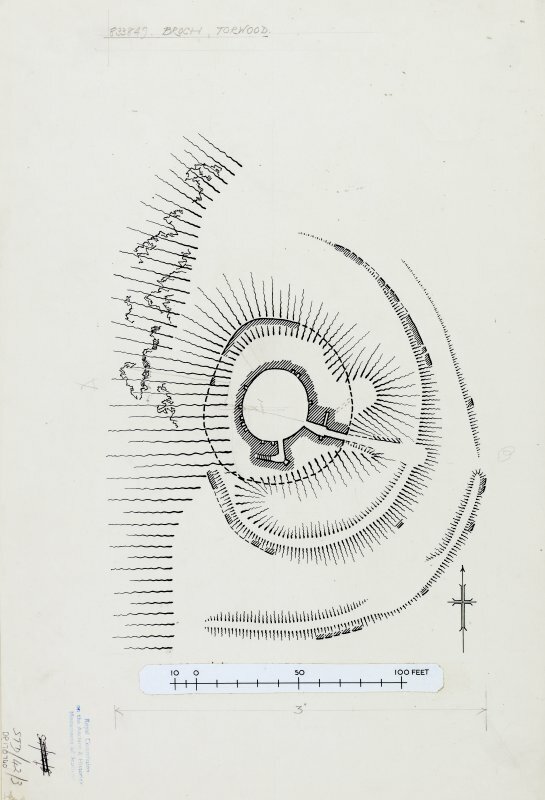 To N, E, and S the broch is encircled by two wasted concentric banks, the ends of which were evidently designed to rest on the brink of the rock-slopes to the W. They were examined in 1948-9 (D M Hunter 1949) and found to represent the ruins of rubble-cored, boulder-faced walls. The inner bank now rises to 6'6", and the outer one to 3'. Gaps occur in both banks in line with the broch entrance. 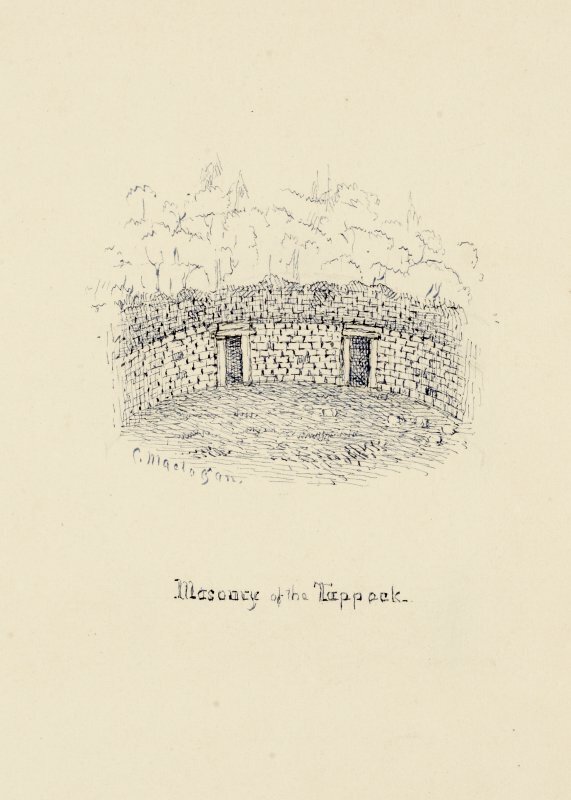 The "third wall" mentioned in 1864 as "extending along the face of the cliff," can be identified with some fragmentary footings seen about 40 yds S of the SW end of the outer enclosing wall. The lip of the slope dips somewhat at this point, and the slope is less steep to N and S; a wall may have been built across the dip to make access more difficult. Finds made during the excavations include three boulders carved with cup and ring marks, saddle and rotary querns, three hollowed pebbles, one of which resembles a crude version of a stone "lamp" of the type found at West Plean homestead (NS88NW 5), stone balls, whorls, sherds of coarse pottery, and two sherds of finer ware which may be medieval, also two sherds of Early Iron Age native ware, etc. No Roman relics were recorded. Some of the finds are in the NMAS, and others in Falkirk Burgh Museum. The broch is generally as described and planned. The outworks are now covered by afforestation and the third bank could not be located. A slab, 13.0cm in diameter, sculptured with three concentric rings, may be seen five stones into the stair lobby from the inner face of the broch. Traces of what appeared to be an intra-mural chamber were observed on the wallhead on the NE side, and a small scale investigation was carried out in the spring of 1964. The built end of a long chamber about 3' deep was found on the wallhead, appearing to run towards the main entrance at a height which would bring it out above the level of the lintels there. It was surmised that this was a secondary structure, possibly recent, inserted after the broch was in ruins. 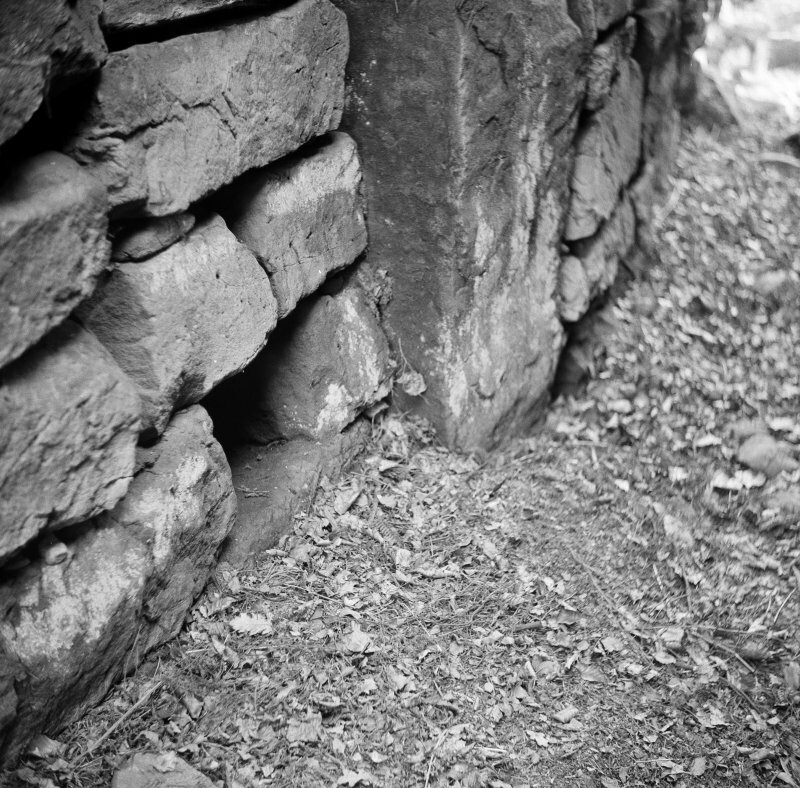 There is a complex carving on a recumbent stone slab at the end of the entrance passage, immediately inside the broch. The carving is of a bar, 19cm long, 9cm wide at one end, and a figure of eight at the other. Small lump of vitrified stone from inner concentric bank on N side of broch. A small piece of daub was also found between the inner and outer concentric banks on N side of broch. 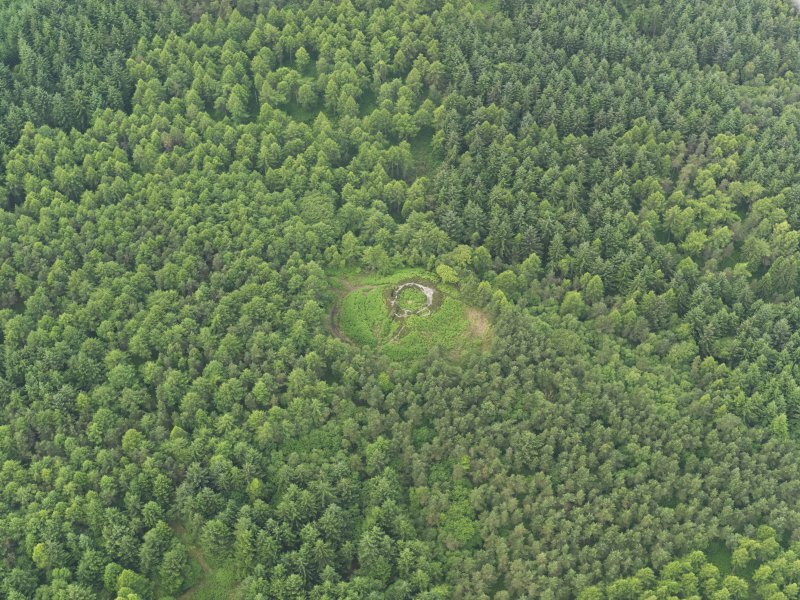 This solid-based broch in Dunipace, Stirlingshire, stands on a hilltop next to a low cliff. It is now in the middle of a forest but many years ago the author photographed it on the skyline when the trees had been cleared. The interior of the broch was cleared out in 1864  and Doreen Hunter undertook a small-scale excavat-ion outside the site in 1948 . The excavators thought that they were exploring a chamber sunk into a natural knoll and removed a mass of boulders and debris, estimated to weigh over 200 tons. The inner wallface was exposed, and an inclined floor formed by the natural rock on which was a central hearth. The entrance passage was found on the south-east – on the downhill side – and also an internal doorway leading to a flight of steps inside the wall; eight of these now remain. There was no stair-foot guard cell. Except at the entrance the outer face was not exposed and it is now hidden even deeper under the excavated debris. The entrance is 0.79m (2 ft 7 in) wide and 6.25m (20 ft 6 in) long. The sunken pathway, partly revetted, which approaches its outer end is presumably a construction of the excavators to keep a way open through the debris surrounding the site, to which they were constantly adding. The massive door-frame is 2.97m (9 ft 9 in) from the outer end and the checks are formed of upright slabs; the bar-hole is visible behind these on the right side with its socket opposite; both openings are 23cm (9 in) square and both are now quite close to ground level because of the amount of debris still in the passage. Most of the passage lintels have now been dislodged. The drawing made at the time of the excavation suggests that the roof was then intact; however it is clear from the text that the lintels were dislodged even then, and that they were replaced: “The roof stones of the lower passage are not in position, but a sufficient number of large stones to form the roof were found in clearing out the passages.” [2, 262]. 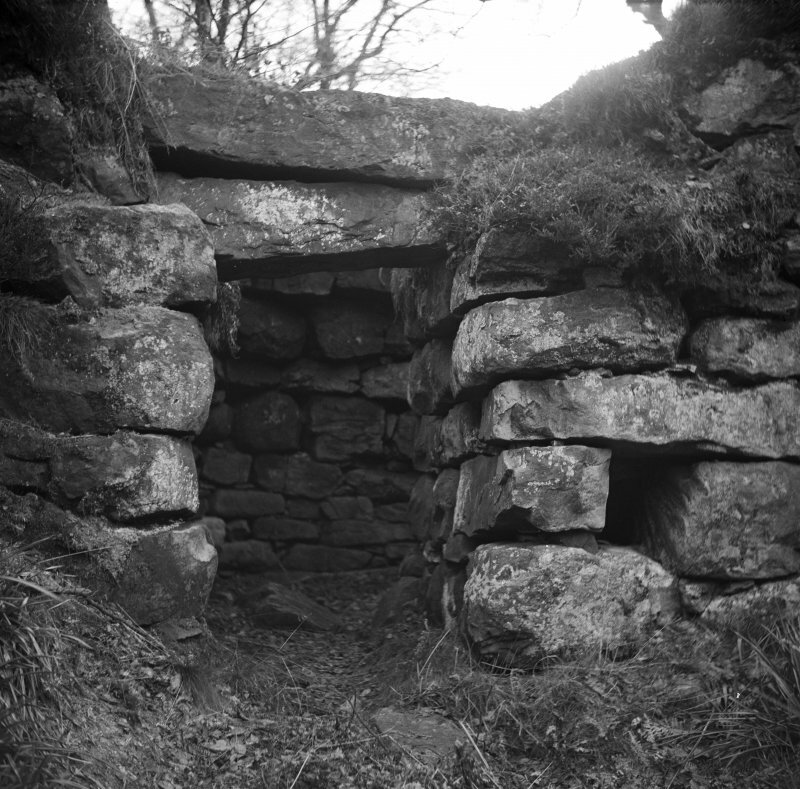 The lintel immediately behind the door-frame is higher than those further forward so that the top of the wooden door would have been protected when it was shut (see Caisteal Grugaig – NG82 1). It is unclear whether this feature is a 19th century reconstruction or original; certainly some such device would be natural in a passage that slopes down towards the exterior. At 7.30 o’clock is the doorway into the wall leading to the stairway which, as noted, lacks a stair-foot cell. Only eight steps now remain of the eleven reported in 1864. 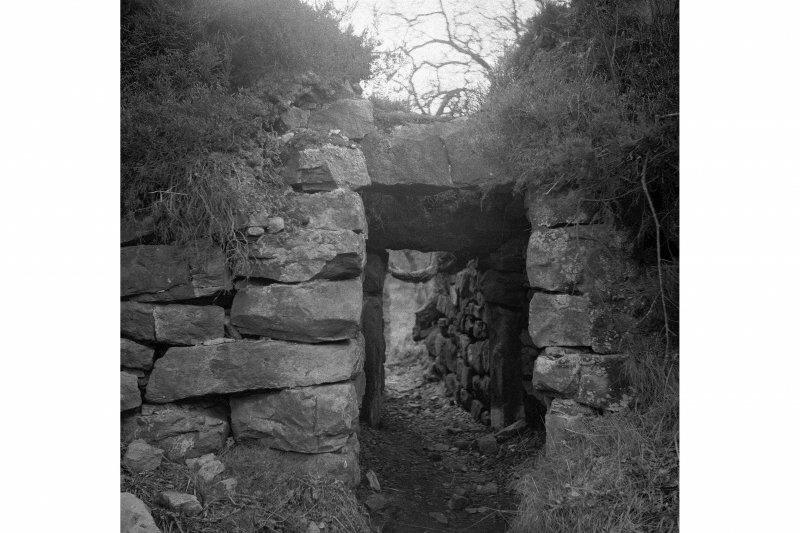 The double lintel over the doorway appears to have been in place when the broch was first explored [2, 260]. 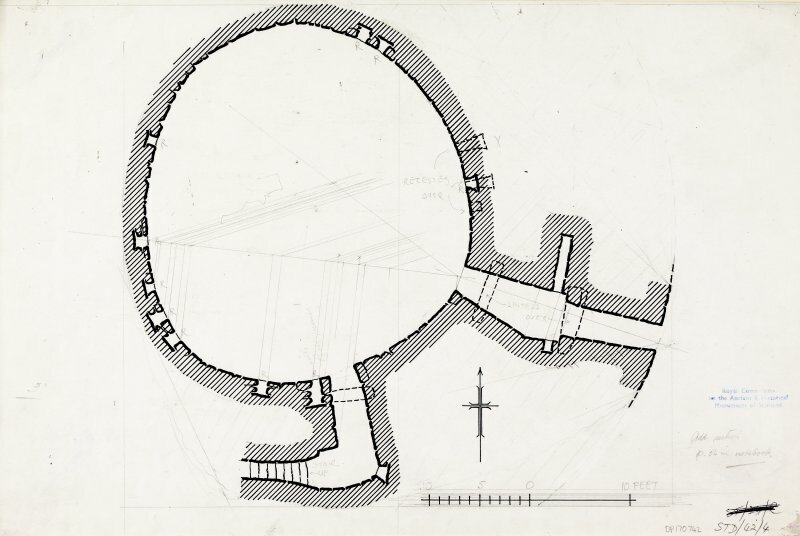 The central court is an irregular shape and is an exception to the normal rule that broch inner wallfaces follow exact circles; a geometrical construction can be made to fit the wall quite well but perhaps not quite well enough to be completely convincing. Half of the wall fits a half circle quite well, and the other half a flattened ellipse. In 1953 the inner face stood about 2.4m (8 ft) above the debris in the court but vandalism and accidents have reduced the height considerably in the intervening years [4, pl. 5]. A ledge-type scarcement – now rather dilapidated – runs horizontally around the inner wallface and up to 2.1m (7 ft) above the original floor. The innermost lintels of both doorways in the inner wallface – now dislodged – evidently once formed part of this ledge. However at the point where the stair rises to the level of this ledge (at about 9 o’clock) there were two courses of masonry above the ledge in 1953. Thus if there was once a landing in the stair at the start of Level 2 any doorway from this leading inwards to the ledge (and on to any wooden floor which may once have rested on it) would have emerged at least 45cm (18 in) above the ledge. The rock floor found by the excavators is now covered with debris, earth, and vegetation; the central hearth, one hopes, is still in position and covered by this rubble and rubbish. Large quantities of charcoal were found on the rock floor all over the court, and especially on the stone slabs forming the central hearth. The internal wallface contains numerous small recesses about 30cm (1 ft) or less in height and breadth, and from 30 - 90cm (1 - 3 ft) in depth. Their purpose is obscure, and the excavators reported that nothing was found in them "except some white clay peculiar to Torwood". Their number is difficult to calculate, as in some places rather similar cavities have resulted from dislodgement of facing stones, but at least 13 may be regarded as constructional features. Small scale excavations were under-taken on the outworks in 1948 and 1949  and these were later planned by the Royal Commission . 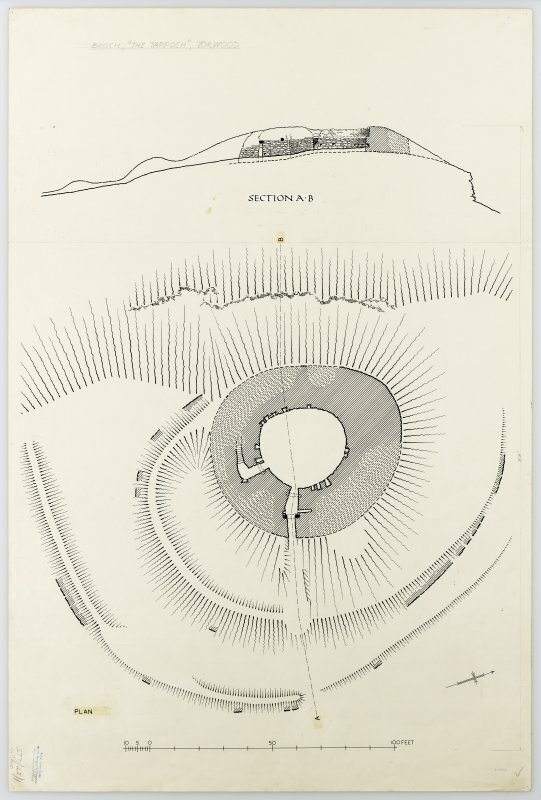 On the north, east and south sides the broch is encircled by two wasted concentric banks, the ends of which were evidently designed to rest on the brink of the rock-slopes to the west. They were examined in 1948-9  and found to represent the ruins of rubble-cored, boulder-faced walls. The inner bank now rises to 1.98m (6 ft 6 in), and the outer one to 93cm (3 ft). Gaps occur in both banks in line with the broch entrance. 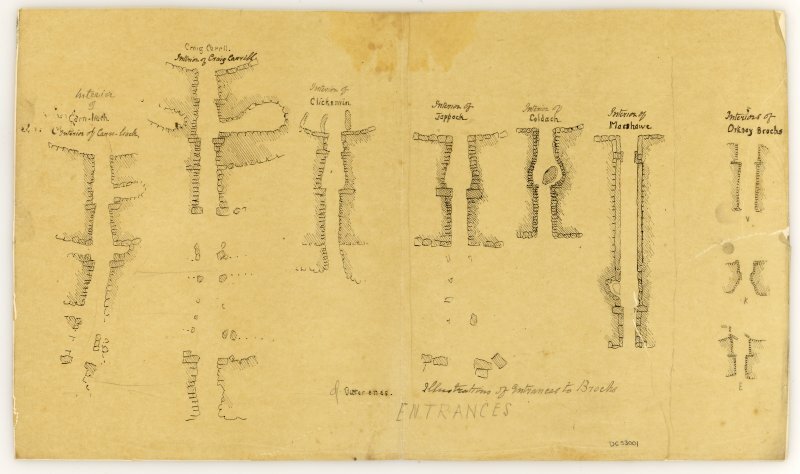 The "third wall" mentioned in 1864 as "extending along the face of the cliff," can be identified with some fragmentary footings seen about 37m (40 yds) south of the south-west end of the outer enclosing wall. The lip of the slope dips somewhat at this point, and the slope is less steep to north and south; a wall may have been built across the dip to make access more difficult. Traces of what appeared to be an intra-mural chamber were observed on the walhead on the north-east side, and a small scale investigation was carried out in the spring of 1964. The built end of a long chamber about 91cm (3 ft) deep was found on the walhead, appearing to run towards the main entrance at a height which would bring it out above the level of the lintels there. However it was difficult to trace the walls for more than a few feet. 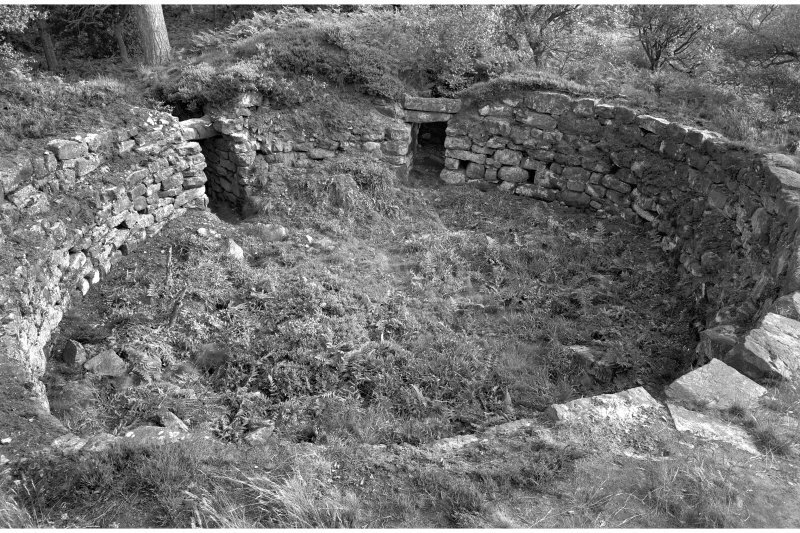 This chamber seems unlikely to have been a broch feature was doubtless inserted after the broch was in ruins . Many years later the author revisited the site and found that the chamber had been re-exposed and that a flight of steps had been built down into it. The most striking aspect of Torwood broch is its sharp contrast with the two neighbouring sites in the Forth valley – Leckie and Buchlyvie (NS69 2 and NS59 2). In the first place its state of preservation when first explored was relatively good compared with the almost completely demolished wrecks that the other two became in the Iron Age. In the second place the material culture that survived in it was sparse and poor compared with the rich array of finds – both Roman and native – found in the other two, and also in Hurly Hawkin (NO33 1) further away in the north-east. Coldoch (NS69 1) is not much further away than Leckie and Buchlyvie but this site resembles Torwood much more, being better preserved and apparently having few finds inside it. The obvious conclusion is that Torwood and Coldoch were built at a different time – either earlier or later – than Leckie and Buchlyvie, and probably by a different group of people who had no contact with the Romans. Unfort-unately there is no way of testing this idea as the first two brochs have yielded no useful dating evidence. An argument could be made for a later date – after direct and local Roman influence had disappeared, perhaps in the later second or in the early third century. As far as the sparse material culture is concerned there is nothing to suggest that the builders and inhabitants of this broch were other than a local Iron Age community. 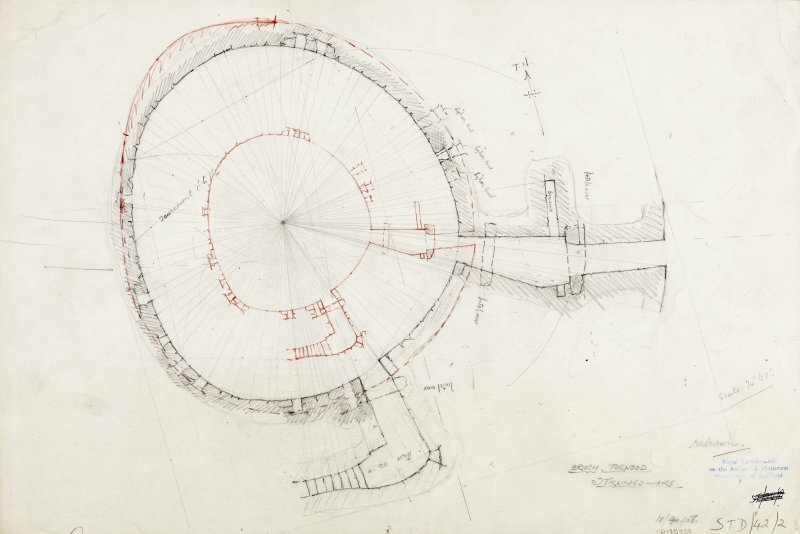 One might assume that a professional broch designer from the far north-east had been recruited to design Torwood and to supervise its construction. These include 3 boulders carved with cup and ring marks, saddle and rotary querns, 3 hollowed pebbles, one of which resembles 1 crude version of a stone "lamp" of the type found at the nearby West Plean homestead [4, 88, no. 104], stone balls, whorls, sherds of coarse pottery (with two sherds of finer ware which may be medieval), and 2 sherds of Early Iron Age native ware. No Roman relics were recorded. Some of the finds are in the NMAS, and others in Falkirk Burgh Museum. Dimensions: at the entrance the wall is 6.25m (20 ft 6 in) thick but measure-ments elsewhere (above the scarcement) vary from 5.19 - 7.32m (17 - 24 ft): the internal diameter varies from 10.83m (35 ft 6 in) from N-S and 9.76m (32 ft) transversely. Sources: 1. NMRS site no. NS 88 SW 1: 2. Dundas 1868: 3. Hunter 1949a and 1949b: 4. RCAHMS 1963, 85-7, no. 100, and pls. 5 and 6: 5. EW MacKie in Discovery and Excavation in Scotland 1964, 50. 6. MacInnes 1985. Many more passing references are recorded . The well-known broch known as The Tappoch stands within a larger enclosure, whose two ramparts are commonly regarded as outworks to the broch. More recently, however, it has been suggested that the broch may have been erected within the interior of an earlier enclosure on the craggy hilltop, and a trial excavation carried out by Murray Cook on what has the appearance of a rib of outcrop about 20m outside the defences on the S suggests that this may also mark the line of an outer rampart, though its precise course and the extent of any enclosure it might form are uncertain. 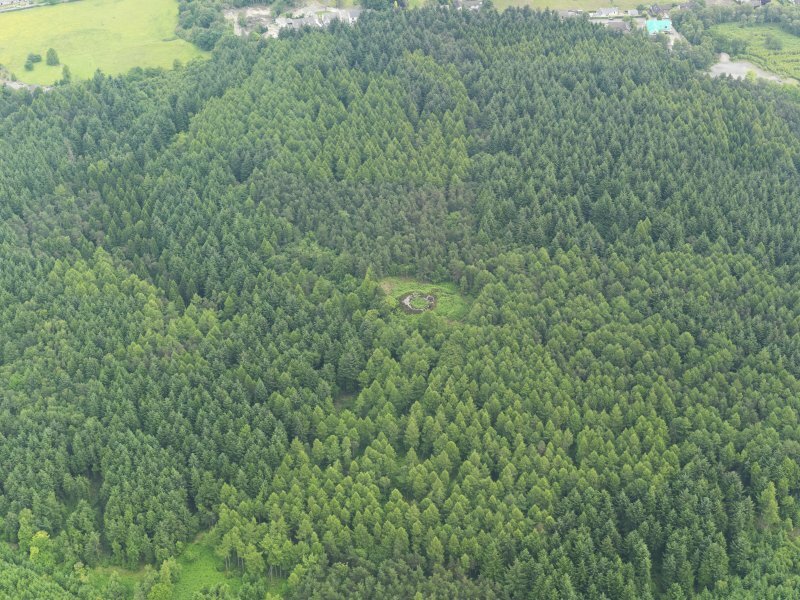 The projected circuit of the inner of the known outworks encloses an area measuring about 45m from N to S by 32m transversely (0.11ha) within a wall about 4.5m thick and 1.4m in external height on the SE, though it peters out to the NE of the broch and cannot be traced to the edge of the escarpment forming the W side of the summit. The outer, displays runs of outer face on the SE, is of lesser stature and also peters out northwards; nonetheless, its projected line takes in the whole of the natural terrace to the N of the broch, enclosing an area measuring about 63m from N to S by 38m transversely (0.18ha). The existence of a third line on the S would enclose an area in excess of 0.2ha. The entrance is on the ESE, on the same axis as that of the broch. Excavations in 1948-49 focused on the outworks, but were unable to elucidate either their date or purpose (Hunter 1949a & b). 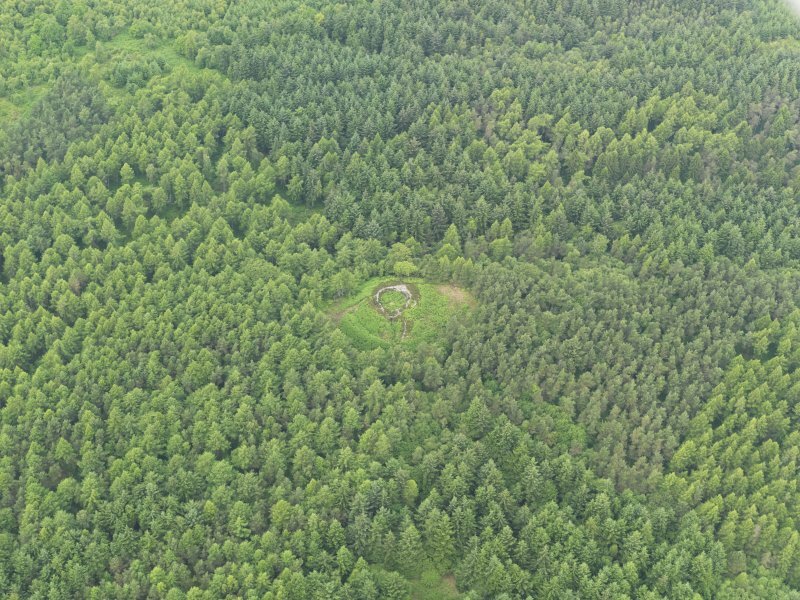 NS 83335 84986 A programme of vegetation clearance, an excavation supported by volunteers, and laser scanning was undertaken at Tappoch/Torwood Broch. The work which was undertaken, 27 January – 1 February 2014, formed part of the Lowland Brochs Project funded by Forestry Commission Scotland. The vegetation, which included heather and bracken and covered most of the broch was removed, by hand, by volunteers, the AaM team (Cara Jones and Phil Richardson), staff from Stirling Council (Fiona Isobel Watson and Murray Cook), and the Archaeology Officer for Falkirk (Geoff Bailey). Mackichan Trust to radiocarbon date the charcoal. 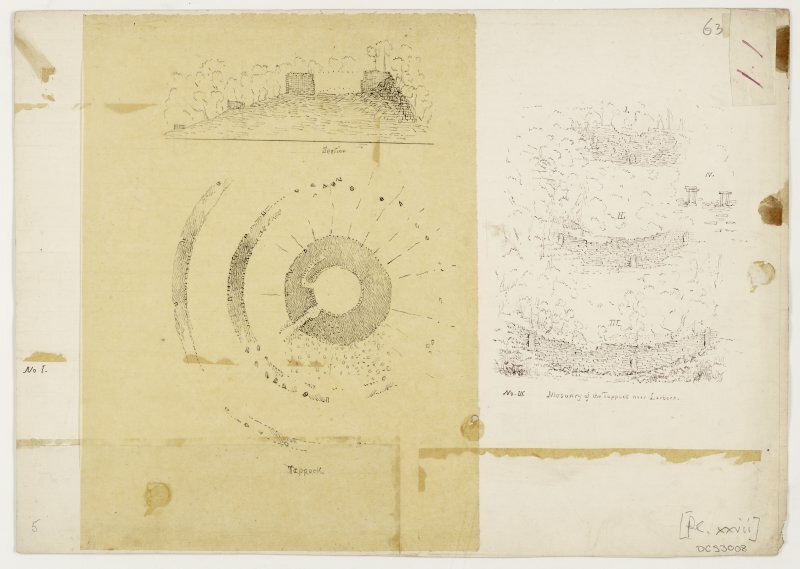 A subsequent phase of work at the site consisted of the laser scanning of the broch, by AOC Archaeology Group (Graeme Cavers and Gemma Hudson) and the production of drawings.